It’s no secret that I’m a huge admirer of Avatar: the Last Airbender, tv show and comics both, so pardon me while I fangirl a little, and bear with my semi-academic writerly argument. But Team Avatar? Totally a detective group, solving the mysteries going on in their own specific time and place with people they know, and (side bonus) getting at solutions for the universal mysteries that recur throughout history and across the earth. You know the ones – situations that crop in history class which seem dead and gone except, wait, they’re still happening. This is going to become ENTIRELY SPOILERY, by the way. HUGE SPOILERS ahead. If you haven’t seen the show and read the comics, turn back and save yourself reading experience while you still can. I mean it. YASH HAVE YOU TURNED BACK YET? can peoples of different nations/ethnicities co-exist in the aftermath of colonialism? And, let us be honest, in the continuation of colonialism, albeit in a different guise? what is the solution to invasion, aka colonialism, aka imperialism? Is it, as the Earth Kingdom nationalists believe, to rid the land of all invading peoples and cleanse the invaded culture? Is it, as Aang believes, to separate the (four) peoples and keep the nations balanced by keeping them distinct, culturally and ethnically? what about the former invaders (several generations down the line) who have put down roots in their new home? Do they not belong because their ethnicity is wrong? Because their ancestors’ immigration was founded in greed and/or need? Is balance possible? what’s a ruler to do? when is keeping your word the honourable – the only – course of action, however personally painful? When is it the wrong thing to do? listen to your mentor, or follow your heart? Do what your teachers (your past selves!) advise, or follow the principles you have always been guided by? is Toph truly the only metalbender, ever? Is she being too hard on her lilylivers *cough* I mean students, or are they just too weak? Where do motivation and discipline end and bullying and cruelty begin? what’s a guy like Asng to do with fandoms? Crash course in fans and fan culture, coming up: the good, the bad, and the ugly… and also the earnest but misguided. where does honest admiration and emulation end and cultural appropriation begin? how does one maintain one’s minority culture when one is a very minute minority? Keep the culture closed? Where are the boundaries and how does one respect (a largely lost) culture without ossifying it? So. With that set of mysteries solved, or with solutions being worked out by the invested parties, it’s time to Search for another mystery. Eh? Eh? Did I earn the Pungeon Master badge? so, what did happen to Ursa? can Azula ever be trusted, even in the slightest? what is her real (evil) plan? what happened to Ursa’s fiance? I mean, he took off into the forest, and there was that montage where he was obviously living in the wild for a while, because he grew a beard and looked totally different, gaunt and all, and then there was that wolf? And then he (the guy) just kinda vanished? what’s up with the wolf? I mean, I love wolves. But. Explain, please? And if Zuko isn’t the real heir (and Azula is), oooooooooh my, what is going to happen to that unfortunate Fire Nation? And – right at the end of the story – is there hope for Azula? I mean, she knows now that her mum didn’t willingly betray her or abandon her, she knows that the woman Ursa has become has compassion for her and would love her. She runs away, still believing that Zuko isn’t her father’s son and that she is the rightful and only heir, and yet the power she has always dreamed of now within her grasp is not enough to keep her from leaving everything and everyone behind – her family (what is left of it), the mistrustful yet kind allies (i.e. Team Avatar), the scheming (her own), the position (at court or in the institution) – because her world has crumbled and Azula for perhaps the first time willingly yields power, has compassion out of the depth of her own pain. anyway. I hope that there is hope for Azula. and I want to know what becomes of her. What does she do and who does she become? actually, let’s start with one of the big things in this series: the rifts between people who should, and formerly did, love one another. The first big divide is between Aang and Toph. Which brings up triggers. On the internet, “trigger warning” is sometimes used as a joke, off-handedly or casually. The Rift takes triggers very seriously. Aang means well, but in his effort to maintain and pass on Airbender culture, even the parts he doesn’t know very well, he unknowingly uses a phrase that triggers a series of very painful memories for Toph. She, reacting to those memories, refuses to participate. Her hostility is inexplicable to Aang, who (after all) is doing his best to prevent a cultural genocide, and who has at the moment an audience: three (hilarious) acolytes. It snowballs. in other words, the comics bring up (as the show did, I believe) that humans are not rational beings; we are deeply emotional, no matter how we pretend otherwise *coughTophcough* and our reactions to current events are profoundly shaped by our pasts. 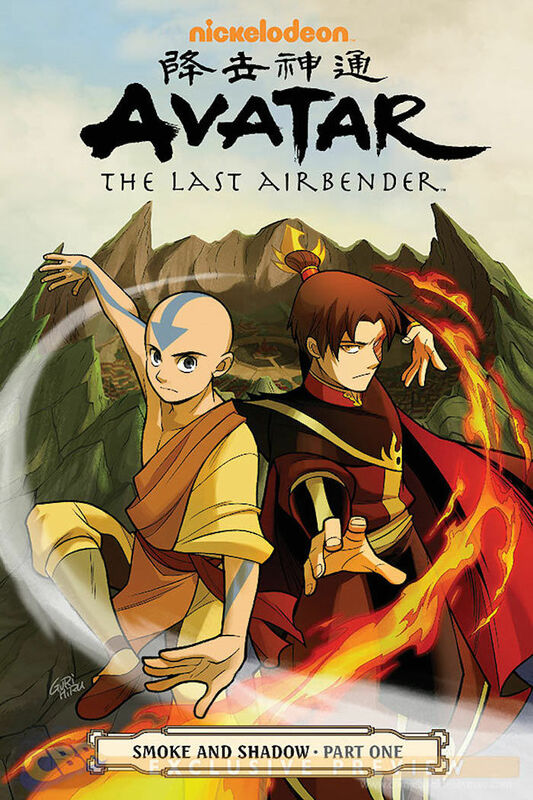 Aang learns a similar lesson when his decision to break off his connection with Avatar Roku hinders his ability to connect with all his past lives. Despite his efforts, Aang cannot reach Avatar Yangchen without conduits like traditions. which is a primary concern of this trilogy: tradition. What to keep, what to toss… sorry, I’m being flippant. Toph stands on one side of this argument: if you can’t remember why you do things, they clearly weren’t important. Aang stands on the other: traditions make us who we are and it’s important to do them, even if the details are a little fuzzy. The truth, of course, is somewhere between the two positions. as the world begins to become what it is during Korra’s lifetime, progress and loss unfold. This is, in a sense, the beginning of environmentalism, or what it would be in the world of ATLA, as industry impinges on sacred land and mass production/machines begin to replace people as a source of labour. Private property or shared land? on a lighthearted note, the phrase “flying fire ferrets” is introduced. Isn’t that the name of Mako and Bolin’s pro-bending team? on a romantic note, there is (at last) the suggestion of a romance for Toph. Other than Sokka, I mean. His name is Satoru, and he is not as much of a pushover as he seems. But will this potential romance develop? but back to the mysteries and themes of this entire series. But can you really argue that the world was so completely different that nobody in the olden days tried to kill anybody? That violence and greed weren’t around? And, of course, there’s the overt mystery of what is causing the earthquakes? Will Toph, Katara, and various other people make it out alive? Can Aang do his avatar thing and appease a certain aangry (haha) spirit, or are humans doomed? Smoke and Shadow is the newest trilogy of comics, so new that only the first is out yet. It is made plain, in this book, that there are both mysteries of state and mysteries of the heart, and, in this case, they’re not far removed. how long will poor Zuko have to face down angry factions who think the solution to all their problems is to assassinate him? With that in mind, who – aside from the obvious – can he trust? who is really behind those supposed kemurikage, and what is his, her, or their agenda? also, how will Noren adapt to life in a palace? let’s not forget the romances: does Mai still love Zuko? She seems to, at first; has she by the end of part 1 set aside their relationship as belonging to the past and unattainable in the future? Ty Lee seems to take to Kei Lo… while he has eyes only for Mai… and by the very end, she is learning to trust all over again. And Ty Lee’s reactions are unknown. So. Love triangle? And then Zuko shows up. And as far as we know still cares for Mai. Which brings to mind another question: what about Suki? There were strong suggestions in The Promise and The Search that Suki was beginning to care for Zuko in more than a guard-to-guarded sort of way. She seemed happy to see Sokka, always, though. What’s going on there? I see two possible rivalries set up. Hoping the girls don’t fall into that! who will rescue Tom-Tom? How? and (slightly irrelevant) where did Iroh learn to act? I guess what I’m really saying in all of this is that the ATLA comics are extremely well written. The plot doesn’t run problem-solution, problem-solution, problem-solution, i.e. in episodes. The plot runs problem1-problem2-solution1-problem3-solution2-problem4. Or something like that. Rising action and all. Multiple strands of plot and character development woven together. Neither situations nor solutions are straightforward; there is always an element of mystery, or of several dozen mysteries. And there is always hope.